THE HEROESONLINE BLOG | CHARLOTTE MINI-CON :: THIS SATURDAY!! 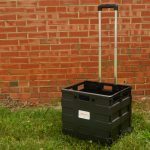 PARKING – COSTUMES – GUEST LIST + MORE!! CHARLOTTE MINI-CON :: THIS SATURDAY!! PARKING – COSTUMES – GUEST LIST + MORE!! 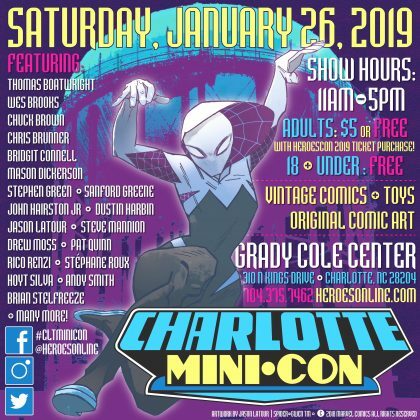 The 42nd Anniversary Charlotte Mini-Con will take place THIS SATURDAY, January 26, 2019 at the Grady Cole Center located at 310 N. Kings Drive, Charlotte NC 28204. The show opens to the public at 11am and will close at 5pm. Tickets are $5.00 in ADVANCE and are available here, or FREE with the purchase of a HeroesCon 2019 3-Day Pass, available here! Advance Ticket holders will gain entry to the convention floor up to 30 minutes before “DAY OF” ticket holders. Tickets will be available at the door for $5.00 to attendees 19 years and older. New for 2019: Attendees 18 & Under get in FREE!! You can see an alternate map of the area here. There is NO SMOKING on the premises of the Grady Cole Center or the surrounding CPCC Campus.